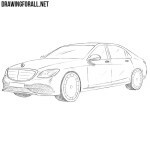 On our website we often draw sports cars and executive cars. 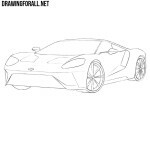 But our readers and subscribers of our social networks often asked us to draw more simple car. So we decided to create a drawing lesson about how to draw a Toyota step by step. To begin with, we need to sketch the exterior outlines of the body of our Toyota. 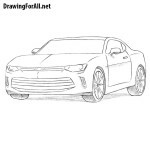 As you can see, all the drawing lessons about cars start about the same – that is at the first steps we always draw the outlines of the body of the cars using light lines. 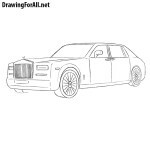 In the second step of almost all the lessons of drawing cars, we usually add the outlines of the main parts of the car. 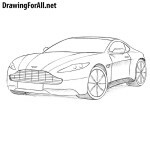 Thus, we sketch out the headlights and radiator grille in the front, the wheels and mirrors in the side of the car. Now you can use dark pencil lines or lines drawn with a liner or ink. Thus, draw out the outlines of the headlights, radiator grille and Toyota logo in the center. Now carefully draw out the outline of the hood. Below the headlights draw out the details of the bumper. Using the cross lines draw the texture of the radiator. It’s time to draw the outer contours of the car’s cabin. Carefully draw out the outlines of the roof and windows, using clear and dark lines. In the same step we need to draw out the outlines of the rear-view mirrors. In this step we finish drawing the car body. Continuing the line of the roof neatly draw out the back of the car. Next, draw doors, door handles and the bottom edge of the car body. This step we call the most responsible. Here we need to draw out the wheels, which of course must be the most rounded and smooth. By the way, do not forget to erase all the unnecessary guidelines drawn by us at the beginning of the lesson. And this step we call the most creative, because here we draw out the rims. If the car body should be similar to the original car, the rims can be of any shape. Therefore, we call this lesson the most creative. So draw the rims as in our example, or come up with your own design. When the drawing is ready, it’s time to add shadows, in order to make the drawing look the most voluminous and realistic. And as always, we need to draw shadows with dense hatching. Our readers often asked us to do a lesson about how to draw a Toyota, and we created this drawing lesson. So write in the comments your requests about the new drawing lessons, and our artists will necessarily create a drawing lesson on your request. So, offer us ideas about new drawing lessons, share existing drawing lessons and subscribe to our updates on social networks.